Crocodiles and alligators are tough. Not much going on upstairs, we've always thought, but crocodilians (the generic name for all 22 species) have lasted on this Earth for longer than most animals have because they are strong, solid, and patient. With big teeth. 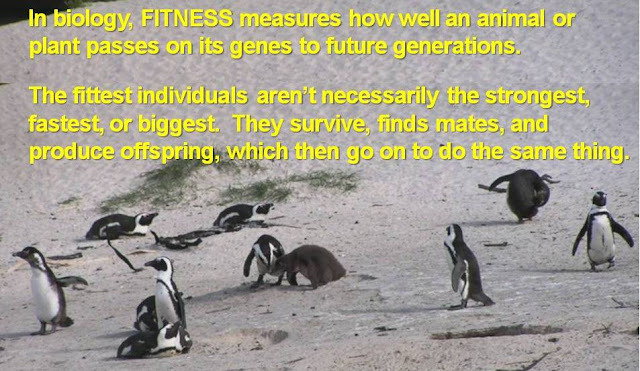 If biological fitness is the sum of survival and reproduction, then crocs and gators have clearly shown they are FIT. Apparently, they are also more clever than we've given them credit for. They are now the first reptiles recorded to use tools, and they join a few birds, one monkey genus, one insect species, and us in using tools to lure other (prey) animals to them. Crocs and gators both hunt by ambush, lying motionless for hours, half submerged in water, attempting to avoid attracting the attention of potential prey animals by looking like logs or anything else but themselves. What's new and cool is their newly-discovered ability to lure prey to them by hiding under sticks. Who wants sticks?, you may ask. Unless you are an ornithologist, in which case you already know, it's birds. Many birds build their nests with sticks and during nesting season, they are always on the lookout for sticks of just the right length and weight for their nests. Among these are wading birds – those long-billed, long-legged herons and egrets that walk the edges of ponds and rivers and then stand motionless to spear fish with their killer bills. 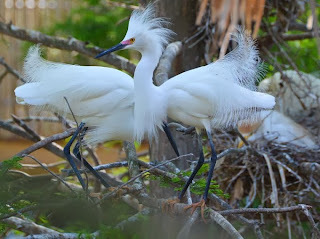 Pairs of wading birds tend to nest together in trees called rookeries. Rookeries are often found near alligator farms or other alligator / crocodile concentration. Wading birds want high biological fitness too -- a high density of crocodilians below will keep away snakes, raccoons, and other potential predators of heron and egret nests. The downside is that if a nestling egret falls down...it likely becomes an alligator appetizer. 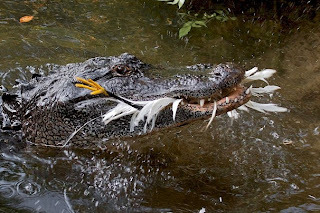 At least 1 crocodile (the mugger crocodile in India) and 1 alligator species (the American alligator) are known to balance sticks on their long, flat snouts to look even more harmless and log-like than they already do. When a bird reaches out to grab the stick...BAAM! 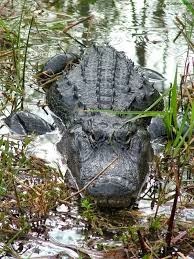 The gator or croc lunges and snaps its jaws. 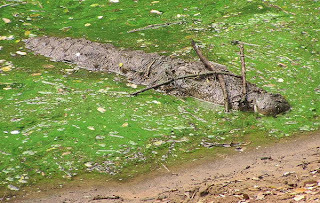 Finding and transporting sticks takes energy, and sitting for hours in the same place prohibits a croc or gator from searching anywhere else, so this behavior isn't seen everywhere. Their use of twig and stick lures isn't haphazard: in Louisiana, U.S.A., only alligators living beneath bird rookeries displayed sticks. Researchers studying the behavior noted that the trees around the rookeries didn't shed many branches and twigs, and there were very few free-floating sticks in the water with the alligators, which suggests that the gators had to collect and bring the sticks to the site themselves. More impressive still is that they use their stick lures only during the birds' nesting season. They don't waste their time and energy when birds aren't searching madly for sticks. In fact, the number of Louisiana alligators in the study using sticks was higher during nest-building time than later on in the nesting season. 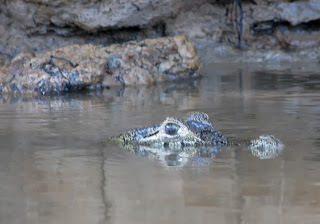 In sum, certain crocs and gators use tools, in the right time and place for them to be effective. Nice work, guys! For details, here is the full study in the journal Ethology, Ecology, and Evolution, and here is a summary focusing on the crocs' use of tools.